/// and of course, Stanley! Hal, with these sound collages, it occurs to me that you are channeling the music of the spheres, the white noise of the universe, the background sounds of pure existence amplified. Perhaps if I was capable of listening closely enough, I might hear the disembodied voices of Caesar, Napoleon and Nietzsche cutting through the haze, emerging from the collective racial memory-mass. Listening to it reminds me of how addicted we all became in the late 80s to the music of Miracle, where it became the soundtrack to our lives at that time. We could listen to hours of it... so much easier to digest than any of the Coltrane/Sanders free-jazz records I possessed at the time. 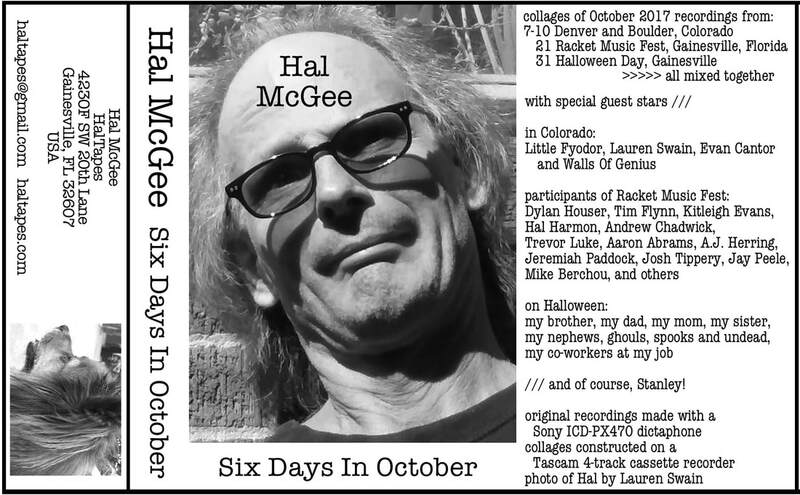 The same can be said of Hal's sound-collages. They might even have a psychological medical application for lonely souls who feel abandoned by the world, by God, by the Universe....Dr. McGee, the cure is in your tapes!